The global polyacrylamide market is gaining from the rising demand for polyacrylamides for water and sewage treatment applications. Treatment of natural water and sewage is closely linked with environment conservation and is thus a present day problem which has gathered the attention of civic authorities in several parts of the world. Using water soluble compounds such as polyacrylamide flocculants, the efficiency of removal of heavy metals in water and sewage treatment processes has increased considerably. The increasing use of polyacrylamides for desalination applications due to its water solubility is positively impacting the polyacrylamide market. 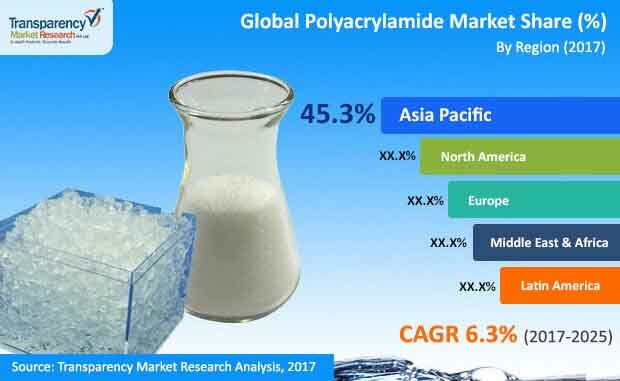 A report by Transparency Market Research orecasts the global polyacrylamide market to clock a CAGR of 6.3% during the 2017-2025 forecast period, for the market to be worth US$7,657.9 mn by the end of 2025 from US$4,429.5 mn in 2016. The report studies the global polyacrylamide market on the basis of type, form, application, and geography. In terms of type, the polyacrylamide market could be segmented into anionic, cationic, non-ionic, and others. Of them, anionic segment led the polyacrylamide market in 2016, followed by cationic segment. The growth of anionic segment is mainly because of its low price leading to its widespread application in water treatment and food cycling. Non-ionic type polyacrylamides are primarily used in the mining industry. In terms of form, the segments into which the polyacrylamide market could be divided are powder, emulsion, gel, and others. Among them, powder form is the leading segment in the polyacrylamide market. Polyacrylamide is most commonly available in powder form, along with its commercial availability in solid and liquid state. Polyacrylamide is widely used in powder form, as liquid form is difficult to store and transport. The others segment of the market based on form comprise solutions and micro beads. On the basis of application, the segments into which the global polyacrylamide market is divided in this report are waste water treatment, oil & gas extraction, mining, agriculture, paper & pulp, paints & coatings, textiles, food, and others. Oil & gas and waste water treatment are the key application segments of this market. Among all, waste water treatment held a significant share of the global market in 2016. Initiatives undertaken by several governments for the conservation of natural water resources is boosting the market share of waste water treatment segment. Oil & gas is a significant application segment as polyacrylamides are extensively used for improving oil recovery and are used as drilling and fracturing fluid agents. The key regions into which the global polyacrylamide market is divided are North America, Europe, Asia Pacific, Latin America, and the Middle East & Africa. So far as dominance is concerned, Asia Pacific held the leading share of polyacrylamide market in 2016. The region led the market vis-à-vis revenue and is likely to hold on to its leading share over the report’s forecast period. The rising demand for polyacrylamide for water treatment applications is the key factor driving growth in Asia Pacific. Growing population and uncertain rainfall patterns in recent years in the region is driving the demand for water treatment chemicals, which is anticipated to open new growth avenues in the upcoming years. North America followed by Europe stood as other significant markets for polyacrylamide in 2016. The demand for polyacrylamide in Europe is anticipated to dip by 1.4% by 2025. Leading players in the global polyacrylamide market include BASF SE, Kemira Inc., Bio-Rad, Ashland Inc., and SNF Group. Polyacrylamides is basically a synthetic resin formed through polymerization of acrylamide. The product is available as a white solid that id soluble in water. Polyacrylamide is majorly used as a as a thickening agent, a flocculant, an absorbent, and to separate macromolecules of different molecular weights. Polyacrylamide finds application in varied market ranging from oil & gas, waste water treatment, textiles, paper & pulp, paints & coatings and others. The report estimates and forecasts the market on the global, regional, and country levels. The study provides forecast between 2017 and 2025 based on volume (Kilo Tons) and revenue (US$ Mn) with 2016 as the base year. The report comprises an exhaustive value chain analysis for each of the product segments. It provides a comprehensive view of the market. Value chain analysis also offers detailed information about value addition at each stage. The study includes drivers and restraints for the polyacrylamide market along with their impact on demand during the forecast period. The study also provides key market indicators affecting the growth of the market. The report analyzes opportunities in the polyacrylamide market on the global and regional level. Drivers, restraints, and opportunities mentioned in the report are justified through quantitative and qualitative data. These have been verified through primary and secondary resources. The report includes Porter’s Five Forces Model to determine the degree of competition in the polyacrylamide market. The report comprises a qualitative write-up on market attractiveness analysis, wherein type, form, application and countries have been analyzed based on attractiveness for each region. Growth rate, market size, raw material availability, profit margin, impact strength, technology, competition, and other factors (such as environmental and legal) have been evaluated in order to derive the general attractiveness of the market. The report comprises price trend analysis for polyacrylamide between 2017 and 2025. The study provides a comprehensive view of the polyacrylamide market by dividing it on the basis of type, form, application and geography segments. The polyacrylamide market has been segmented into anionic, cationic, non-ionic and others based on type. Type segment have been analyzed based on historic, present, and future trends. Regional segmentation includes the current and forecast demand for polyacrylamide in North America, Europe, Asia Pacific, Latin America, and Middle East & Africa (MEA). Additionally, the report comprises country-level analysis in terms of volume and revenue for various segments. Key countries such as the U.S., Canada, Germany, France, the U.K., Spain, Italy, India, China, Japan, South Africa, Mexico, and Brazil have been included in the study. Market segmentation includes demand for individual application in all the regions and countries. The report covers detailed competitive outlook that includes market share and profiles of key players operating in the global market. Key players profiled in the report includes BASF SE, Solenis LLC, Ashland Inc., SNF Group, Bio-Rad Laboratories and others. Company profiles include attributes such as company overview, number of employees, brand overview, key competitors, business overview, business strategies, recent/key developments, acquisitions, and financial overview (wherever applicable).